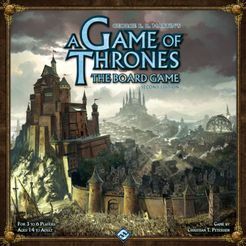 Buy A Game of Thrones and PriceWatch, Buy this board game at the Lowest Price. So there are six included houses in this version. And surprisingly (though understandably) House Targaryen is absent from the war. It makes sense being that the game takes place exclusively on Westeros and the Targaryen forces are all at sea/other continents. But it's strange that Fantasy Flight Games would ignore this House knowing it's fanbase and connection to the series. The Houses that are included are Lannister, Stark, Tyrell, Martell Baratheon and Greyjoy. Now, there's something you should know from the outset, before you even begin playing. All Houses are not created equal in the Game of Thrones. Stark has a clear and persistant advantage in the game, it'll become clearly noticeable by your second play through. Because of Winterfells placement on the map they have two spots to reach the sea and there are only 2 choke points that need to be defended. This may seem game breaking at first. Afterall, why would you play any other house? There are a few things that keep the Starks in check. The first is that in order to win you need to claim hold over 10 castles. These castles are spread around the risk like board. And unfortunately for House Stark, there aren't a lot of close castles to Winterfell. This means they have an uphill struggle ahead of them as they battle their way through the Houses south of them (Greyjoy & Lannister) in order to secure castles. In effect it means that House Stark needs the game to last longer in order to win. While a house like Baratheon, which may seem weak and small, has almost immediate access to a multitude of castles. The other disadvantage for Stark is that this advantage becomes known after your second game. Most of the time, the other players aren't exactly jumping to help you during battles. In fact House Stark is treated like a leper when we play. Often the player controlling the House will have to offer extra rewards in order to receive aid. Now that that's out of the way, let's talk about the game itself. The game plays like Risk for the purposes of layout and battle mechanics. However there are some awesome twists that help separate it. Game of Thrones Second Edition mixes in a huge amount of social gameplay, something a lot of games try to do but seem to always fall short of. This game encourages you to lie and backstab your friends in order to win. And that's what makes it so neat. At the heart of the lying and backstabbing are five tokens. Each one dictates a different action. March, Defense, Support, Raid and Consolidate. Before you place these tokens on the game board you discuss strategies and forge alliances (that you will most likely break the very next turn) with your fellow players. House Greyjoy may see that House Lannister is mounting for an attack and ask for aid. House Stark can then tell House Greyjoy that they will aid them, for a price of course. Once all treaties and discussions have ended, each player places one Token on a controlled land in turns until each controlled land has a token on it. The tokens are placed face down so that no one can see the orders that have been played. This is where things get tense. On flipping the tokens you will see whether or not House Stark was true to its word and is indeed sending support. But that token might flip and be an attack order and now House Greyjoy is being attacked by both the Lannisters and the Starks. Or even more wicked, the token could flip to reveal an Aid token. The Greyjoy player might sigh in relief only to find out that the Aid was meant for Lannister the entire time. Maybe those Houses have a secret pact that was forged through text message. This is without a doubt my favorite part of the game. The deceit and trickery that goes into each turn is cackle enducing. Each house has a deck of House Cards that help during battle. And again House Stark has a clear advantage. Their cards are just more useful and powerful then the other Houses. One thing that bothered me was how vanilla these cards are. They're supposed to represent each House's most powerful members and give bonuses for that combat. They do offer bonuses but when you take away the art each card could have simply had a plus or minus on it and then a number. They are that vanilla. I think this is a huge missed opportunity. It would have been great to have each member offer up a bonus in combat but provide the army with a unique ability. Have Jamie Lannister be able to destroy one infantry before the battle starts, for example. It also would have been awesome to allow the capturing of each House's heroes. Think of the great gameplay that would have emerged from telling someone you will give Arya Stark back to House Stark if they pay a ransom. Then when Stark hands over the money, you execute (discard from game) the Arya Stark card. It would have made for yet another way to lie to your friends and I think it really hurts the game that these cards are so ignorable. It's important (though probably obvious) to note that Game of Thrones Second Edition is not a short game. In fact I don't think we've played a game that's taken under two hours. But I don't think that's ever been a complaint. I think our main complaint was with the instructions manual. Which spat out the information like a Tarantino film. I don't understand why developers don't put directions in the order that things happen during the game. Our first game took near four hours because we were constantly flipping through the book in order to answer a question. This wouldn't have been an issue had the information not been placed in weird spots or just mentioned briefly in a paragraph where 90% of the information was about another topic. I think the Game of Thrones Second Edition is still the best representation of the world in game form so far. I hope to see expansions that add new depth to the combat system or even a few new houses.